MANILA, Philippines – Another quality PBA semi-finals basketball brought to us by San Miguel Beermen (SMB) and Rain Or Shine Elasto Painters (ROS). After a huge comeback made by Alaska Aces last night against Purefoods Star Hotshots, San Miguel intensifies the Commissioner’s Cup Semis by overcoming Rain Or Shine’s 24-point 1st half lead and secured game number 1 of their best-of-five series, 101-95 on Thursday, July 2, 2015 at the Smart Araneta Coliseum in Cubao, Quezon City. Great start for The Rain Or Shine Elasto Painters as their import Wendell McKines opened the ball game with a two-handed slam dunk and immediately followed it with a put-up basket while the San Miguel Beermen went for a 0 out of 5 shooting until Junmar Fajardo placed them on the score board. McKines started hot with 12 points under his belt with just 5 minutes gone by after the tipoff. Meanwhile, Arizona Reid, his counterpart, opened the ball game slow with only 4 points. Reid who was Rain Or Shine’s reinforcement for 2 conferences way back in 2011 and 2014 won the Best Import Awards in the said years under the mentorship of Coach Yeng Guiao. AZ Reid and his former ball club had parted ways in an unlikely manner before he ended up with San Miguel as a replacement import during the Governor’s Cup early this year. Rain Or Shine had already tallied 4 three pointers after the first 12 minutes of the ball game, courtesy of the wide-bodied and work-horse Wendell McKines who had a near double-double in the first period: 14 points and 8 boards. Paul Lee added one more trey as ROS began the 2nd quarter. SMB Head Coach Leo Austria scratched his head hard after his starting Center committed his 3rd early personal foul and his team downed by 24 points with 10 more minutes remaining in the 2nd. Beau Belga twisted his right ankle late in the 2nd quarter while trying to defend the driving Junmar Fajardo. Belga was assisted by the ROS staffs to the bench limping and hopping. A sigh of relief for Rain Or Shine owners Raymond Yu and Terry Que who were on the bleachers as Belga walked by himself towards the locker room for further medical attention. Reid, Fajardo and Lassiter were all in double figures with 12, 14 and 14 accordingly to deflate the lead to just 14, 60-46 heading to the 2nd half of this 1st best-of-five game series. It was the humongous gap in the rebounding department that killed San Miguel during the first 24 minutes. The Painters recorded 31 boards compared to just 18 of the Beermen. McKines alone had 13 rebounds plus couple of a dozen points against his rival-import’s 5 rebounds and 12 markers. Arwind Santos who came from hibernation gave his team’s first 3 points of the quarter. That three also happened to be Santos’ first basket of the ball game. San Miguel, was slowly but surely closing the scoring gap. The 24-point first-half ROS lead has been trimmed down to 7. But “not too close” as per Jeff Chan as he fired and brought the lead up again to double digits. Beau Belga announced his re-entry with a bang from downtown after re-taping his sprained right ankle that he sustained during the first-half. Coach Leo Austria made a big gamble on letting Junmar Fajardo play with 4 personal fouls. Just like Fajardo, Chris Ross got himself into foul trouble by committing his 4th personal foul. San Miguel finally found their rhythm late in the penultimate quarter and was able to bring ROS’ lead to two-possession ball game. Wendell McKines was called for Flagrant Foul 1 for hitting Ronald Tubid at the back of his head. Tubid sank both technical foul shots. AZ Reid was also fouled on transition and was awarded with 2 free throws for the 1st deadlock of the ball game 74-74. San Miguel took the lead from Alex Cabagnot’s flawless trey, 80-79 marching onto the final canto. Arwind Santos has finally awaken from a deep first-half sleep as he led the Beermen in protecting their hard-earned margin. Paul Lee grabbed their lead back with a straight three that prompted Coach Leo Austria to bring Fajardo back to the floor. Cabagnot launched a long bomb for a 2-point SMB lead while McKines tied the ball game 95-all. Marcio Lassiter drove to the basket to break the deadlock. San Miguel finally broke away after Arwind Santos blocked Jeff Chan’s 3-point attempt that could be an equalizer. They held on to their 4-point lead until the final 2-minute mark. AZ Reid delivered when he was needed the most with 47 seconds remaining on the game clock to give SMB a two-possession ball game 101-95. 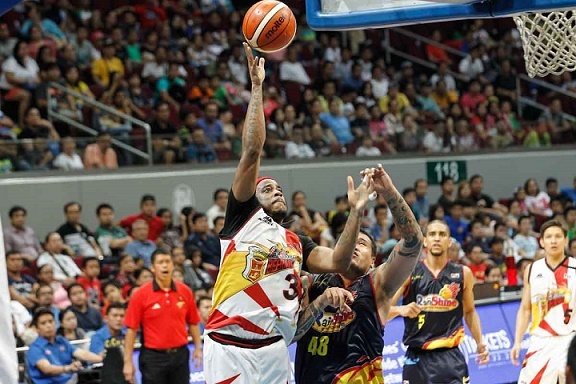 The San Miguel Beermen will take a day off with 1 game advantage over the Rain Or Shine Elasto Painters.